Geodesic domes are great! They can withstand the forceful winds of the high desert and provide shade from the intense sun. We've constructed our our geodesic dome and have provided plans for building a dome tent from steel conduit (EMT). This section offers a geodesic dome calculator, as well as plans for the construction of a dome cover from heavy duty tarps. The plan for the top of our geodesic dome cover. This is the plan for the side pieces of our geodesic dome cover -- they are pentagonal in shape. The outlined area is the full size of the tarps we used. One tarp yielded 2 pentagons. The interior ceiling is an individual piece that hangs suspending inside the dome, beneath the screens. This allows for air flow out the top vent while providing shelter from the overhead sun. Diagram of a single side pentagon that is part of our geodesic dome cover. This is the story of our custom built, form fitting geodesic dome cover. It was handcrafted with silver tarps and vinly cement in May 2006. A step by step guide to building a geodesic dome shelter from steel conduit (EMT). In March 2006 we constructed our first geodesic dome from EMT steel conduit. In this article we share what we learned from our dome building experience. 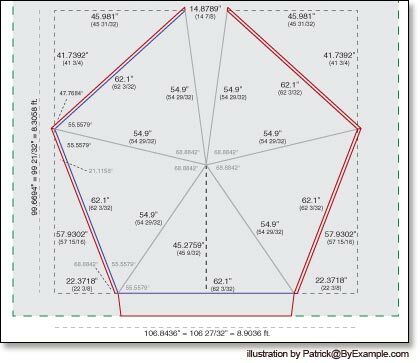 Our geodesic dome calculator simplifies dome planning for 2V, 3V and 4V domes. Geodesic domes are comprised of a network of triangles that form a somewhat spherical surface. There are several dome classes that are referred to as 1V, 2V, 3V etc. The more complex the network of triangles, the more spherical the geodesic dome and the higher the class number. A 1V dome has fewer triangles, uses only one size triangle in its simple pattern, and less closely approximates a hemisphere. A 6V dome has many triangles of multiple sizes that are arranged in a complex pattern to create a more smooth and spherical shape. Higher class domes offer greater structural stability and are ideal for larger dome frames. Our geodesic dome calculator will calculate the length and number of struts for 2V, 3V and 4V geodesic domes based on the specified radius. It automates the calculation of geodesic dome formulas to simplify planning.